This campaign and the last are part of Designers Against Aids (DAA), an organization to raise AIDS awareness to those interested in pop culture, where many people seem to believe AIDS is only a third-world phenomenon. By showing that our pop culture icons are doing their parts to spread awareness and promote preventative methods, DAA will try to spread this notion to today’s youth. 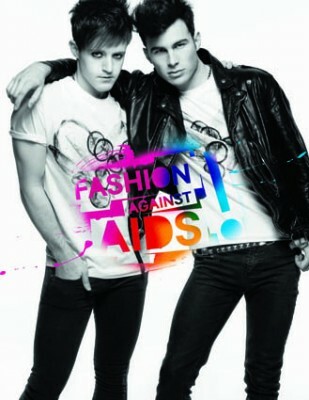 Each artist involved in the “Fashion Against Aids” campaign adds his/her/their own flare to the clothing line. All fans will enjoy supporting a good cause and wearing clothes their idols designed themselves. Who wouldn’t want nice clothes and to support a good cause? So why don’t you take a minute to check out the DAA website for some more information about AIDS and things every individual to do to help! I have been looking in vain to find this kind of site, now I have found it! :) I will be following you, (yes, I like that sort of thing :P!) but just wondering how often you post to this webpage with new stuff. Seems like a lot of feedback already, hope you will be able to get to mine, thanks. Eventually, you make an update to your blog. I was waiting anxiously for the next update. Lets hope you will consider updating more reguarily so your readers can easily follow along. I would not have much joy in life right now but your blog is one of them. I realize life is busy but I really hope you will make an effort to keep us updated on any progress. Nice webpage, I bookmarked your site to get more posts. Awesome blog design too! Ciao! We did not understand your second paragraph in any way. What do you mean by that? This really is an interesting topic for me so I want to understand everything you need to say. We were not able to find all kinds of other articles during my search although My organization is not very computer literate so that is certainly why. Lets hope to see you publishing more frequently. I envy your work , thankyou for all the useful posts . This can be a topic that I have an amazing strong passion about. I’m sure most people today forget how important this theme is. I believe this is the foundation upon which a great many other things are built in case we do this stage wrong, there are various dire consequences in the future. Thus, we should be careful and think about how we want to technique this topic. I thank the author for giving a fantastic first try at approaching it. CREE XR-E LED Rechargeable Torch Flashlight Black K35 is one such LED flashlight, which is made from high strength t6061 aeronautic aluminium alloy by CNC technology. It is powered by 1×18650 high power memory free of charge eco friendly Li-ion rechargeable battery. Its capacity is 2400 mAh high capacity. The maximum lighting distance covered from this LED torch is 200 metres. This is a brand new torch and we will talk about some of its internal feature that may well assist you in deciding whether or not to obtain this product or not. It is a black coloured torch with 180lm brightness. It makes use of rechargeable battery of 1*18650. As the shell material is having excellent strength, it can easily put on resistance even though it goes under Anodic oxidation therapy. The lifetime of this Cree XR-E LED Rechargeable Torch Flashlight Black K35 is up to 100,000hrs. It covers 200 metres distance with its light. The voltage, at which it operates, is 3.7V with operating existing to be of 750mA. It can have runtime storage for 2 hours, which additional depends on the battery and how significantly it had been charged. You have various buttons that offers you different modes of its operations. Cool web blog and cool blog layout, I look forward to more from you. Thanks for sharing! Very nice web blog, I understand this more now. Thanks for sharing!. Looks like you have a lot of visitors here, must be a seriously popular website! Nice read, Cheers! We did not understand your second paragraph in any way. What does one mean by that? That is an interesting topic to do so I want to understand everything you have to say. We were not able to find all kinds of other articles during my search although I’m not very computer literate so that is certainly why. Lets hope to see you publishing more frequently. I’d trouble viewing your website on my mobile cell phone browser. Are you aware if your website can support mobile browsing? I’ll save this page later to watch on my laptop computer in the home. Lets hope you will update your current blog more frequently. Cool blog. This is definitely better than the others I have recently visited covering this. The page design is very organized, I think I am going to steal this. Just kidding…Thank you! Thought you should know, great blog, interesting to read all the comments. Great blog. Many websites like yours cover subjects that can’t be found in print. I don’t know how we got by 10 years ago with just magazines and newspapers. I’d be inclined to cut a deal with you one this subject. Which is not something I typically do! I love reading a post that will make people think. Also, thanks for allowing me to comment! Insightful points:) Going to take a bit of time to think over your site! This is certainly an excellent article and I completely trust what you said. We are trying to setup the Rss but I am possibly not very computer literate. Can someone tell me how we can setup the RSS feed so I get notified of any new blog post? Remember to explain it in an simple to implement way as I ‘m getting old. I did not understand your second paragraph in any respect. What don’t you mean by that? That is an interesting topic to me so I want to understand everything you must say. I had been not able to find all kinds of other articles during my search although I will be not very computer literate so this can include why. I hope to see you publishing more frequently. here. And these, the stoneheaps of dead builders, a warren of weasel rats. Great blog. Lots of blogs like yours cover subjects that just aren’t covered by magazines. I don’t know how we got by 12 years ago with just magazines and newspapers. Refreshing and I would like to thank you for the time you put into this article.very informative. I wish there were more blogs like it. In any case, I felt it was about time I thanked you.I am not that big of a reader to be candid however your web sites pretty high-quality, keep it up I have your blog bookmarked to catch any further material. I enjoy your work , regards for all the interesting articles . Very efficiently written information. It will be supportive to everyone who utilizes it, including myself. Keep doing what you are doing – for sure i will check out more posts. Wow! It’s like you read my mind! You seem to know a lot about this, just like you wrote the book in it or something. I think that you can do with some images to drive the content home a bit, besides that, this is great blog. A great read. I’ll certainly be back.